Oh, the excitement of picking a pattern among many and finding a suitable yarn with a similar gauge, the excitement of starting a new project! Nothing can be compared to this happy feeling of anticipation, hope, and certainty that this one is going to become your best ever. However, after making some progress and maybe even finishing a part (or two), doubts start creeping in: have I made the right choice? Have I picked the right size? Is it going to fit my body? You feel much less excited and more worried, hesitant, and uncertain. You get to your most vulnerable point when, if something goes wrong, you might stop working on the project or even unravel the whole thing altogether. And some projects become unbelievably boring when you are actually working on them: a mindless repetition after only few rows makes you antsy and restless, ready to start doing anything but staying in place and knitting. I think that boredom is a major killer of projects. They die “in utero” not because they are too difficult, or a pattern is not clear enough, or there is not enough yarn, time, or space for working on them. They die because of boredom. Those who can find their way back to their work and overcome boredom become knitters with lots of finished projects. And those who can’t, quit knitting altogether or become “process knitters” with lots of unfinished projects. I prefer to finish my knits, yet, since I am only human, in many cases boredom gets almost unbearable. Over the years I invented some tricks to make myself pick up the stitches and finish a boring project. Until recently I didn’t even think about them as tricks, so much they were ingrained in me like a long-standing habit. However, recently I 1) had to work on several really boring but useful garments; 2) read a book Atomic Habits by James Clear (great book, highly recommend); and 3) watched the second season of Patriot on Amazon Prime. These three incidents made me seriously think about boredom in knitting and how to deal with it. And now I decided to share with you some of my ideas. But first, what Patriot has to do with knitting? Nothing, of course. If you don’t count that I absolutely loved the first season which allowed me to tolerate the second season that wasn’t particularly good. At some point in the second season the main character, an unlucky CIA operative, played by adorable Michael Dorman, explains how he accomplishes some grueling and painful tasks that come up in his line of work. “I go 50% plus one step in and then there is less than half left and it would be faster to get to the end than to turn and go back. This is how I get to the finish”. I am not sure the quote is correct but you get the point. And it does apply to knitting and finishing directly. Sometimes it is enough to finish a back and half of the front to feel morally obligated to finish the whole thing as soon as possible. I use a row counter when I knit and as soon as the back is finished I know how many rows approximately will be in the front. So I just summon all my willpower and get to the middle of the front plus a bit more – and voila! It is faster to finish. Of course unraveling is faster, and sometimes it is necessary, but you can talk yourself into believing that from now on it will go faster and if you are good at self-persuasion, it will. Fake it till you feel it, or something like this. The book Atomic Habits is about developing good habits and getting rid of bad ones (again, it’s brilliant, highly recommend). One of the ways of stopping procrastination and starting doing something that you don’t want to do is to attach this action to something enjoyable. For example, I need to swim as much as possible because of my bad back, and I am not a big fan of swimming. So I bought an MP3 player for swimmers and listen to music while I swim – much more fun. The same with knitting. Some boring parts can be done while watching TV, or talking to friends, or listening to a book, music, podcast, or radio. Some people can knit in a car while on a road. I personally get carsick but sometimes, rarely, I have to do it in a car just to get to 51%. Sometimes, when it is only stockinette, I knit and read a book. It works well when the book is captivating otherwise you'll fall asleep even faster. My last personal trick is to give myself a day's goal, to decide how much I should accomplish in a day before I even start knitting. And this goal must be real and doable. For example, "knit 20 rows of the back". Or "get to the armholes on the front" etc. Keeping your eyes on a reachable target makes you move ahead steadily without being distracted by doubts. One more thing. When I start knitting, I take very few brakes. I am not the one to stop and admire my handywork every five minutes. That is why there are few pictures of my work in progress. I hardly ever photograph my projects before there is some progress made. Can you think of any other tricks? If you do, please share them with me. Here is my first project that would put me into sleeping coma after a row or two. It is a Japanese pattern (you know how much I love them) from Daruma pattern book 2. The pattern is easy and straightforward. It is made on big needles with thick yarn. There is a clear chart with all the rows, increases and decreases. My only problem was the different row gauge. While making the back I kept measuring my work to figure out where to stop and change needles or do decreases. Probably, that is why the back was finished quickly enough. But then it was fronts’ and sleeves’ turn and I started moving at snail’s pace. At first, I was really annoyed with myself: why couldn’t I finish this whole thing faster – it was so easy. Yet, every time I’d pick up the needles, after a row or two of plain stockinette my eyes would close of their own volition. Fortunately, there weren’t that many rows and I managed to finish all four parts at the end of December. The assembly process was more complicated, and, therefore, more enjoyable. Since the yarn for this cardigan is extremely soft and fluffy, I put extra thought and effort into the bands’ ribbing: used twisted stitches, slipped last and first stitches on both sides – so it would help to keep the cardigan’s shape. For the same reason I cast off the shoulder stitches on the back and two fronts and sewed them together instead of using Kitchener stitch. This cardigan is all about little details: a V at the back of the neck, balloon sleeves, and a bit balloonish body shape make it subtly unusual and interesting. It has no buttons but I like it this way. And it can be closed with a pin. The yarn – Wool And The Gang’s Feeling Good Yarn – was bought as a kit to make a totally different cardigan. Yet, after careful consideration, I decided not to make it and used 5 out of 6 balls for my Margaux Red (the yarn color is called Margaux Red, hence the name). I’ve worn it many times and so far there is no peeling, or shedding, or any other unpleasant surprises. The yarn does feel good and I loved working with it. I would love to use it again in future. 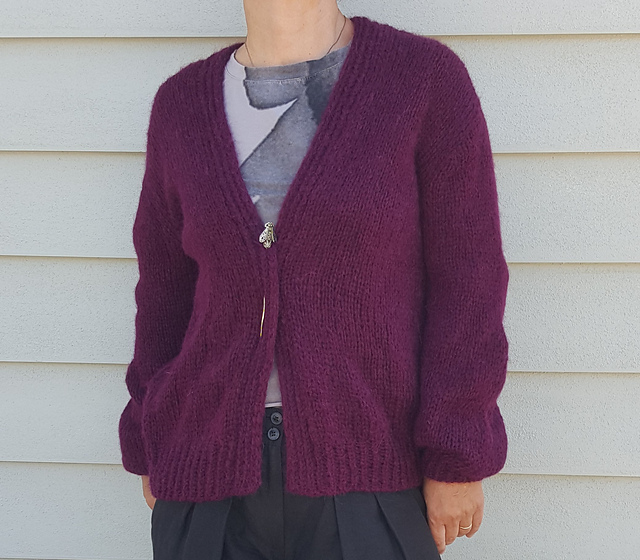 As usual, you can find more pictures of the cardigan on my Ravelry page. Thanks for another interesting post. Boredom is best tackled by me with an audiobook (right now I'm listening to "The Happiness Hypothesis" by Jonathan Haidt. I looked it up on Amazon and it sounds promising. Is is really good?